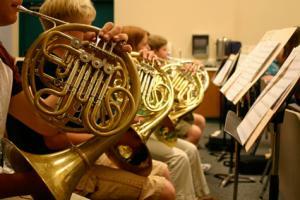 Inspiring six-day music camp for students in grades 6-12. Each summer, student musicians (grades 6-12) from throughout the region gather at the beautiful California State University, Stanislaus campus, in the heart of the great Central Valley of California. Since 1995, our program has given young musicians the opportunity for enrichment in the musical arts. The program provides performance and rehearsal opportunities through individual, small ensemble, and large ensemble instruction. Take a look at the sessions we offer, and come make music with us! Summer Music at Stanislaus has been offering rewarding, inspiring musical experiences to young musicians for over two decades. In addition to the traditional style electives such as music theory and ear training, we also offer classes that allow students to learn and explore skills and techniques outside of their normal large ensemble routine. These electives include percussion for non-percussionists, singing for non-singers, rock band, song writing, chamber music, conducting and rehearsing, recording and production, and more! Our program also includes sessions of music listening that will broaden your student’s musical knowledge by exposing them to new musical genres. We’re very excited about the creative possibilities offered in these electives and believe that you will find them uniquely rewarding.